Here’s a partial listing of (possible) concerts/performances that theatre-goers might be interested in. Entire schedule here. With companies like Ning making it so easy to build your own network, shows like Rock of Ages, Shrek, and Altar Boyz, which is one of my productions, have been able to create the ultimate niche social network for their ultimate fans. By doing so, they can identify their most powerful ambassadors and communicate with them constantly. The niche network strategy only works with shows (or products) that have customer bases that are naturally drawn to social media. In other words, you won’t see a revival of Hamlet creating ToBeOrNotToBeFans.com; there’s nothing more depressing than a playground with no one on the swings. The umbrella niche of all of these micro-networks are sites like BroadwaySpace.com, which serves as a funnel for Broadway fans. PBS’s Antiques Roadshow (count me in as a fan) has announced their first $1-million appraisal – four pieces of Chinese carved jade and celadon from the Chien Lung Dynasty (1736-1795). It was conservatively praise at $1.07 million. 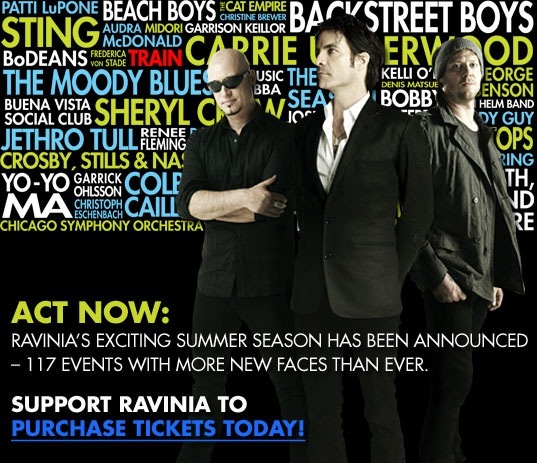 Ravinia Festival’s backstage blog highlights the fact that July is National Hot Dog Month. And in honor of this, the park will feature hot dog hawkers for select performances. Be sure to check out the rest of their blog while you’re at it!